Quarter Round is used to accent the transitions from baseboard to floor surface, especially in retro fitted floors where the baseboard typically is not removed. The Quarter Round provides a subtle blend between the gap in the floor and the wall. Coordinates with hardwood flooring to provide a beautiful finished look to any room. Buy online Zamma Red Oak /Wilston/Raymore Natural Solid 3/4 in. Thick x 3/4 in. Wide x 94 in. 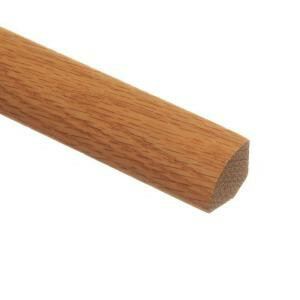 Length Hardwood Quarter Round Molding 01400301942503, leave review and share Your friends.